Israeli by Day, American by Night: Coulda Been Worse! Close quarters, I'd say, and everything was old and falling apart. Our new base, however, is large and clean, all the rooms are so brightly lit and fresh, and you can't help but get the feel that you're staying in some kind of ultramodern hostel. Only the Air Force has nicer bases than this, but I bet we give them a run for their money (minus the swimming pools, movie theaters, and bowling alleys...). Anyway, I was reminded of that cheerless Michve Alon during a short stay at a very large southern base near Gaza. We were there for a simulation, as I mentioned in the previous post. As soon as we got there we had to get to work setting up the huge tents in which we would sleep. They had concrete floors and drains on the side to capture water, and in the middle were holes for the poles to go into. It took us nearly an hour and a half to really get the tents finished, as in rain and wind ready (weatherized as only us Americans say, apparently). For beds we had cots and tough mattresses. And of course, you needed your sleeping bag. Well, the sleeping wasn't so bad, but there was no room to put any of your gear, no closets, and no central area to move about. It wasn't comfortable. The point of this post is to express my sympathy to those myriads of Americans serving in Nachal, another infantry unit. I'd say that most Western immigrants in infantry go to that brigade, and they even have a very popular non-citizen infantryman program. People come for 18 months just to do the army, and they go to Nahal. You see, Nahal are still sleeping in tents. At the end of my worst days on base (not counting in the field, of course), at the end of miserable days spent in the mud, I still come back to luxurious living. I lay on my bed with the A/C blasting, tons of space all around to walk and put your stuff wherever you please, and personal and private space in my locker to keep all my mementos. At the end of a long day I crawl up in my corner, isolated by the closets between the beds, and find my privacy. I don't think Nahal has that. I'm sleeping in comfort, and they're out in tents. They're braving the cold or the heat no matter what. I strip down to basketball shorts and a t-shirt, even if it's five degrees outside. They're sweating it out or bundled up in their jackets, even when going to bed. I empathize. But hey, that's why Golani is called #1. I would say "Suckers!," but honestly, the Nahal base is a real problem. Here's an article from JPost about the Nahal base being a carcinogen, literally. I've been told to give advice if I'm criticizing the army in any way. Here's the advice: Give my good American-Israeli brothers in Nahal a nice new base! This is bad news. I will be in Israel in Augest to serve in Nahal through Machal. Sleeping outside in tents sounds better than sleeping in the base in Arad. nice blog! 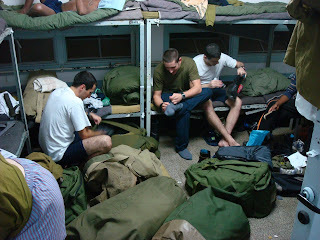 Im an american serving in nachal, and the tents are terrible! I wonder if it is just money that is keeping the army from building us rooms. I know that tzanchanim and golani enjoy the highest budget of the infantry, but i still think the army has us in tents for a reason (I hope). but really, its either always hot or cold, uncomfortable, no space to dress or move around...please appreciate your rooms and realize how lucky you have it! That's just wrong, man. Golani are supposed to be beast-men, sleeping on the ground, disdaining tents. Most certainly also when you are in battle you will expect 5 star accomodations at night! I'm at mikve alon now! Love reading your blog. Good luck in your service.